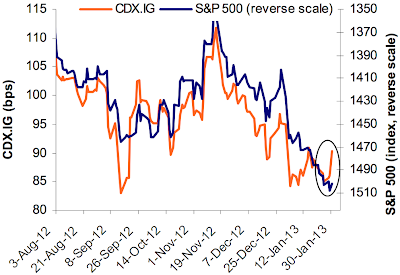 Has the equity market been conditioned, like Pavlov's dogs, to expect a last minute sequestration deal? Why has there been no negative market reaction when it was reported (via NBC) that Obama would meet Congressional leaders on Friday, after the sequester deadline [emphasis added]? After weeks of argument over the sequester, bipartisan congressional leaders will meet with the president at the White House on Friday -- the same day that automatic federal spending cuts are scheduled to go into effect. President Barack Obama will meet with House Speaker John Boehner, House Minority Leader Nancy Pelosi, Senate Majority Leader Harry Reid and Senate Minority Leader Mitch McConnell to discuss the across-the-board budget reductions to federal agencies, aides told NBC News. Republicans were quick to question why the White House would schedule the meeting only on the final day of the belabored back-and-forth over the cuts. "If the President is serious about stopping the sequester, why did he schedule a meeting on Tuesday for Friday when the sequester hits at midnight on Thursday?" a Republican aide told NBC. "Either someone needs to buy the White House a calendar, or this is just a - belated - farce. They ought to at least pretend to try." I have been watching Defense and Aerospace stocks, as represented by ITA and PPA, as a barometer of market sentiment about the effects of sequestration. As you can see by the relative performance of ITA against the market, ITA has been in a minor relative uptrend for most of February and has beaten the market in the last couple of days. The relative performance of PPA also shows a similar pattern of relative outperformance for February and this week. So let me get this straight. President Obama is meeting with senior Congressional leaders to discuss sequestration on Friday, after the deadline has passed. Meanwhile, the Dow rallies and defense stocks, which are highly sensitive to government spending, are outperforming the market. Is the market just conditioned to getting a last minute deal, just like what we saw during the 2011 debt ceiling impasse, or endless eurozone summits over Greece in the same year? What happens to equity prices if the cavalry doesn't arrive? Just as the market has to worry about Italy and the prospect of sequestration, I am seeing signs that the consumer is becoming increasingly stressed and consumer spending is slowing. Consumers are clipping coupons at a rate not seen since before the 2007 recession, and that's a troubling sign, according to Coupons.com CEO Steven Boal. The website tracks how often people view and print coupons and their redemption rate. Right now, Coupon.com's Internet Coupon Index, as it's called, shows a spike in coupon offers and demand. This pattern is almost identical to the one that played out right before the last major economic downturn. The higher the index value, the more consumers are under economic pressure, Boal told CNBC.com. In addition, Gallup maintains a daily estimate of consumer spending and it has been trending down for most of February. While this data series is noisy, the downtrend in the 14-day moving average is troubling. Gallup daily consumer spending 14 day average at $82 up $14 YoY ! Gallup has been very positive for 3 months, although a little less so in the last week or two. The ICSC varied between +1.5% and +4.5% YoY in 2012. This week was again close to the bottom end of that range for the ICSC. The JR report could just be a one week anomaly, we'll see. Even in the worst case, it still looks like consumer spending has not collapsed due to the tax withholding increase. It's worth noting that WalMart is not included in either ICSC or Johnson Redbook. Nevertheless, I remain highly concerned about the ability of the American consumer to significantly contribute to growth in the near term given the data points that I mentioned. Should sequestration hit, the results could be even uglier. Given these risks and the underperformance of cyclical and consumer discretionary stocks (see my previous post Will the bears get their second wind? ), traders who are bullishly positioned should be hyper-sensitive about their risk control discipline. Will the bears get their second wind? The weakness in equities last week was no surprise to me - though the trigger of the adverse liquidity effect the Fed removing QE was. As I reviewed the charts on the weekend, it became apparent to me that this week coming up could turn out to be pivotal in the tug-of-war between the bulls and bears. Right now, it's not clear to me whether the weakness last week will turn out to be a shallow correction or a much deeper one. As I documented last week (see Take some chips off the table) cyclically sensitive stocks are rolling over relative to the market. A review of some of the major sectors of the US stock market shows this to be the case. Consumer Discretionary stocks have violated an important relative uptrend against the market. The way I read it, cyclically sensitive stocks are faltering. Defensive sectors are rallying but have not fully assume the mantle of market leadership. This week coming up is a key test for bulls and bears alike. Can the bulls regain the mojo? Can the bears get a second wind? While I am leaning slightly bearish because of negative technical conditions (see J.C. Parets' analysis on negative divergences and the signal from insider selling), I have to respect the upside potential posed by a couple of major market moving events this week. First, there is the Italian election, where Silvio Berlusconi is attempting a comeback on an anti-euro platform (see this discussion by Joe Wiesenthal of Business Insider on the mechanics of Italian elections). A win by Berlusconi or a deadlocked government could really spook the markets. The other is the looming sequestration cutbacks scheduled to take place on March 1. Based on the experience of the recent past, it seems that the markets have an ingrained Pavlovian response that there will be a last minute deal and remain relatively complacent about the outcome. I could go on and on about how to analyze the politics of sequestration, but I have no idea of the outcome. I just know one thing for certain, we will have volatility. I wrote that I had been watching the behavior of cyclical stocks for a signal that a correction may be starting (see Correction? Watch the cyclicals!) and we may have seen that signal yesterday. Is the consumer getting into trouble? Consider, for example, the relative performance of Consumer Discretionary stocks against the market as a measure of risk appetite. This sector began a relative uptrend against the market last August but declined through a relative uptrend yesterday. This move, in conjunction with the behavior of other key sectors, may signal the end of the risk-on trade for the time being. I still don’t see the recovery in the various housing indices that many are raving about. To me, this looks almost exactly like what I’ve been predicting all along. A sideways market that is consistent with past bubble experiences. Think Nasdaq, Shanghai, Gold in the 80s, etc. In essence, it looks like a big L.
CNBC reported that Americans are tapping home equity again as home prices have bottomed and started to appreciate again. I believe that HELOCs have been one reason why consumer spending has held up well despite the increase in payroll taxes this year. So what happens to the consumer if the housing price recovery were to pause here? And the latest numbers aren't good. Worldwide dealer sales accelerated in the three months ending in January. The North America and Asia/Pacific regions posted double-digit declines. Note that this is not a "dive in the bunker" bearish call, but a warning that it may be time to take some chips off the table and to re-balance portfolios toward a greater emphasis on risk control. Time to buy gold and commodity stocks? Last week, I wrote that traders looking for a correction should closely monitor the behavior of cyclical stocks (see Correction? Watch the cyclicals!). So far, cyclical stocks remain in a relative uptrend when compared to the market and their relative uptrend remains intact. There is no hint that a correction has begun. What I do find unusual is that while the relative performance of cyclical stocks remain robust, the shares of commodity producers continue to lag. This is curious when resource stocks represent the most cyclically sensitive sectors of the stock market. In addition, the price of gold is deflating despite the talk of currency wars. Gold is an alternate currency and should be a beneficiary under a scenario where global central banks engage in competitive devaluation. However, the price of gold is fallen so much that a dark cross, or death cross, is rapidly approaching. In the past few months, gold stock investors have fared worse than holders of bullion. I have been a long advocate that gold bulls should hold bullion rather than the shares (see Where is the leverage to gold? as one of many examples of previous posts on this topic). However, we may be approaching a point where traders could tactically favor gold stocks over bullion. 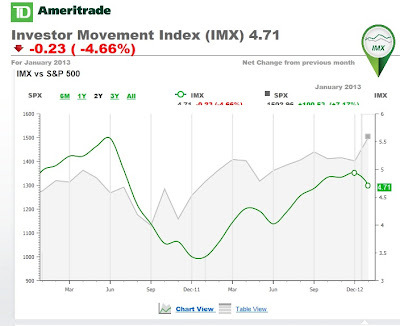 The graph below show the ratio of the Amex Gold Bugs Index (HUI) against the price of gold charted on a weekly basis. I have further overlaid a 14-week RSI on the top panel. Note that weekly RSI is now below 30 indicating an oversold reading. 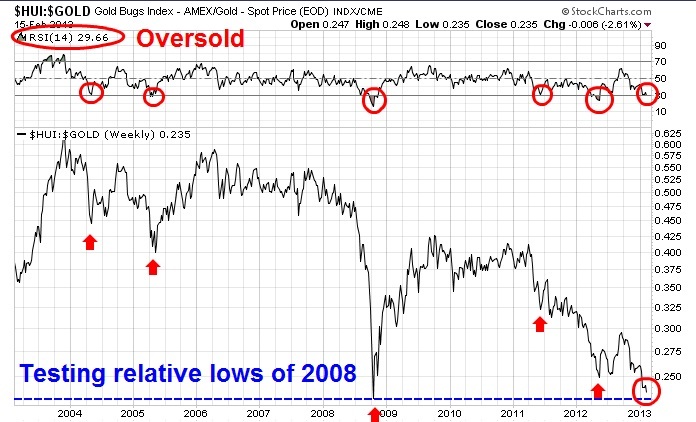 Past oversold readings have marked points where gold stocks have outperformed gold. In addition, the HUI/gold ratio is nearing the bottom of 2008, when investors dumped gold stocks in a bout of panic selling. An analysis of the relative performance mining stocks show a similar pattern. 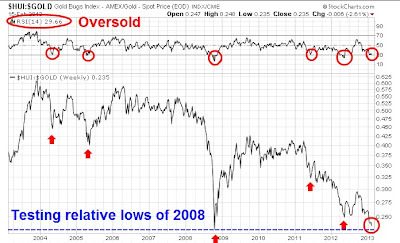 Mining stocks are also approaching a key relative support level marked by the 2008 panic bottom. These charts suggest to me that mining stocks are getting washed out and they are poised for a reversal in the months ahead. Within the resource and commodity producing sector, energy stocks show a more constructive relative performance pattern. The chart below of the relative performance of this sector indicate that energy stocks have rallied through a relative downtrend line, i.e. they've stopped underperforming and a reversal may be close at hand. Based on this analysis, my inner investor tells me that it is time to start accumulating positions in energy and mining. My inner trader, on the other hand, wants to dip his toe in the energy sector, play the golds for a bounce and wait for the relative reversal in mining before committing funds. I DO NOT KNOW IF ITS OVER. It could be, but I suspect it is not. I do think that it is in the process of coming to an end, and that’s why I used the baseball metaphor of in the 7th inning. Demographic effects on fund flows: The Baby Boomers are just starting to retire and take money out of stocks. Who are they going to sell to? My favorite long-term valuation metric is Market Cap to GDP (via VectorGrader) as a rough proxy for the aggregate Price to Sales for the stock market. 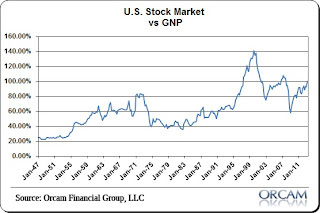 Market Cap to GDP, shown on the top panel, remains elevated relative to its own history. Secular bulls have historically begun when this measure has been depressed. In addition, note how falling Market Cap to GDP ratios have corresponded to secular bear markets, which have shown up as sideways markets. 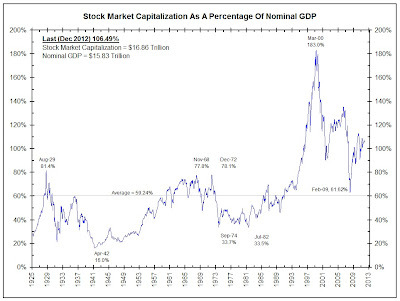 The above chart of Market Cap to GDP only goes back to 1950, in which we have only had one episode of a secular bear, or sideways market. Barry Ritholz also showed, in a separate post from his secular bear post, a much longer history of this ratio that goes back to 1925 from Bianco Research. 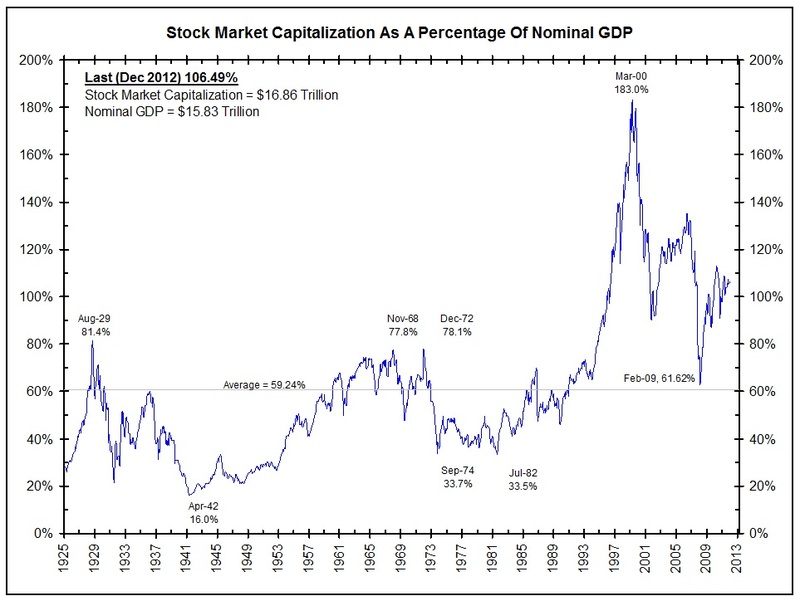 Market Cap to GDP remains highly elevated relative to its own history. That's one reason why I don't believe that a secular bull can start from current levels. For the first time since the recovery began, Warren Buffett’s favorite valuation metric has breached the 100% level. 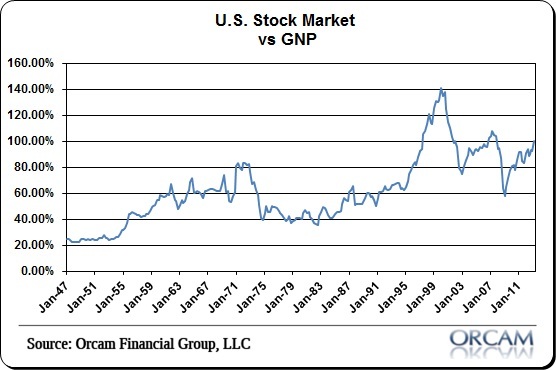 That, of course, is the Wilshire 5,000 total market cap index relative to GNP. See the chart below for historical reference. I only point this out because it’s a rather unusual occurrence and the recent move has been fairly sizable. It happened during the stock market bubble of the late 90′s, but then occurred again just briefly during the 2006-2007 period when the valuation broke the 100% range in Q3 2006 and stayed above that range for about a year. We all know what followed the 2007 peak in stock prices. Another reason for the continuation of a secular bear, or sideways stock market, is the outlook for fund flows. Simply put, stock prices rise when there are more buyers than sellers. So what happens when Baby Boomers in retirement or nearing retirement withdraw money from stocks? Can their children and grandchildren support stock prices at these price and valuation levels? I wrote about this topic in 2011 (see A stock market bottom at the end of this decade) and cited two demographic studies by the San Francisco Fed and by Geanakoplos et al. The conclusions of these studies were that the projected inflection point where the fund flows of the Echo Boomers into stocks start to overwhelm the fund flows of their parents the Baby Boomers is somewhere between 2017 and 2021. Until then, we will have to live with the ups and downs of a sideways and range bound stock market. Investors should therefore expect that the risk-on/risk-off environment should continue until the end of this decade. The summit comes as supermarkets in Britain were urged by the Food Standards Agency to test pork, chicken and other meats for cross-contamination. Meanwhile, Tesco has admitted that it had been selling frozen spaghetti bolognese ready meals which were between 60% and 100% horse meat. Tomorrow's meeting has been called by Ireland, which holds the EU presidency, and where the scandal began after horse meat was discovered in frozen beef burgers. The country's agriculture minister Simon Coveney said the summit was being held to discuss "whatever steps may be necessary at EU level to comprehensively address this matter". 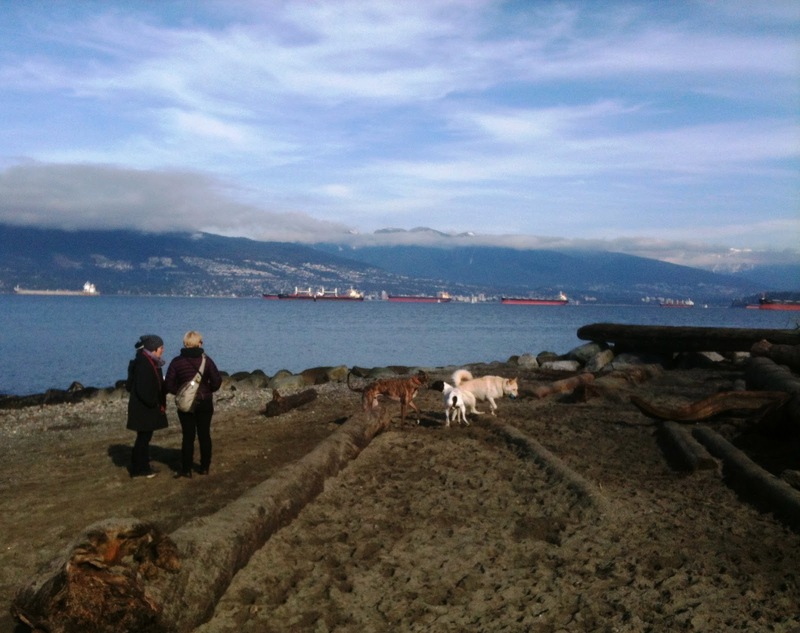 Measures on the agenda will reportedly include labelling processed meat for its origin. Meanwhile processed meat manufacturers in Ireland have been asked to carry out DNA testing in a bid to reassure consumers and export markets. As a follow-up to yesterday's post (see Is the credit market cruisin' for a bruisin'?) where I detailed signs of froth in the credit market. I offer the following anecdotes of rising risk appetite. Uniformly, he found that the view was this: The Fed had its hand on the till, and there was almost no way for risk assets to go down in light of the Fed stimulus. Virtually everyone was bullish. Even the bond managers aren't worried about a great-rotation inspired selloff (they're not really that worried about a shift from bonds to equities) though it is in the back of their minds. Many analysts have called this week's Asiacell IPO the first test of the Iraqi stock market. Would foreign investors flock to a region that has been viewed as volatile with no stability? I wanted to see if you would be interested in speaking with the portfolio manager for one of the largest equity funds in Iraq, _______. He says the Iraqi market is primed to become the best performing international investment and it’s no longer just about oil, as Asiacell proved on Sunday. _______ says infrastructure, telecommunications, transportation are all positioned for growth. He says the big picture of Iraq has changed dramatically since the US forces and media pulled out of the country. _______ understands the Iraqi markets better than most traders, entrepreneurs and investors. He has visited Iraq many times, meeting with the country's biggest business leaders. He brings an unfiltered perspective on how the Iraqi market is evolving, and has said the market is ripe with potential. * Why telecommunications in Iraq is igniting a productivity surge similar to what the US saw in the 1990s. * What the Asiacell IPO means to the international market. * Why many American investors may not be seeing the big investment picture in Iraq. * Why many companies in Iraq have PE ratios below 4. * Why _______ believes the Iraqi market is poised to become one of the best performing markets over the next decade. Hmmm,the Iraqi stock market as the next *ahem* frontier. How special! Yesterday, I mentioned several parts of Latin America as being hidden investment gems for our international strategy. Another sleeper out there is segments of Africa where private equity is finding a home and even more liquid capital inflows into equities are rising to levels not seen in two years - to little fanfare, the frontier markets are up 8% so far this year, outpacing both the developed world and the traditional emerging market universe. See Investors Scramble for Africa on page 19 of the FT.
Is it well known that the Nigerian stock market is up 63% over the past year or that Kenya is up 46% (in USD terms)? Does anyone even know where these countries are on a map? Ghana has been a real hotspot for money inflows and its market has rallied 18%. Of course, liquidity is low in these markets and volatility high, but by all accounts, forward and trailing P/E ratios are among the lowest in the world and the FT article cites a nice 6% dividend yield to boost. I could write about how 16 year-old Desperate Housewives actor Rachel Fox became a minor celebrity for her day trading activities or the WSJ article about how individual investors are funding currency trading with credit cards as examples of froth, but that would be too easy. But when the perennially bearish David Rosenberg starts to tout frontier markets like Nigeria, Kenya and Ghana, be afraid, be very, very afraid. Is the credit market cruisin' for a brusin'? The first thing to remember, writes Antczak, is that mutual funds and ETFs together are responsible for a big portion of the marginal flows into corporate credit markets in recent years. Mutual funds now account for $1.7 trillion of the market, up 69 percent from the first quarter of 2009, and ETFs are responsible for $200 billion – up 328 percent in the same time period. In any vanilla corporate bond deal, when it comes to market for its public offering, there is a period of information dissemination, followed by taking orders, followed by cutoff, followed by allocation, then the grey market, then the bonds are free to trade, then a flurry of trading, after which little trading occurs in the bonds. period of information dissemination — depending on how hot the market is, and deal complexity, this can vary from a several weeks to seven minutes. taking orders — you place your orders, and the syndicate desks scale back your orders on hot deals to reflect what you ordinarily buy and even then reduce it further when deals are massively oversubscribed. When deals are barely subscribed, odd dynamics take place — you get your full order, and then you wonder, “Why am I the lucky one?” After that, you panic. cutoff — it is exceedingly difficult to get an order in after the cutoff. You have to have a really good reason, and a sterling reputation, and even that is likely not enough. allocation — I’ve gone through this mostly in point 2.
grey market — you have received your allocation but formal trading has not begun with the manager running the books. Other brokers may approach you with offers to buy. Usually good to avoid this, because if they want to buy, it is probably a good deal. bonds are free to trade — the manager running the books announces his initial yield spreads for buying and selling the bonds. If you really like the deal at those spreads and buy more, you can become a favorite of the syndicate, because it indicates real demand. They might allocate more to you in the future. after which little trading occurs in the bonds — yeh, after that, few trades occur. Why? Corporate bonds are not like stocks; they tend to get salted away by institutions wanting income in order to pay off liabilities; they mature or default, but they are not often traded. What's more, investors have been raising their own risk levels to chase yield, such as maturity extension (i.e. going out longer along the curve) and buying lower credits. Antczak indicated that bond duration of new issuance is way up, indicating rising price risk as investors extended maturity. The consumer-lending joint venture of private-equity firm Fortress Investment Group and insurer American International Group is planning a rare securitization of subprime personal loans as early as this week, in the latest test of risk appetite for asset-backed bonds, where soaring demand has pushed yields to record lows. The $604 million issue from consumer lender Springleaf Financial, the former American General Finance, will bundle together about $662 million of loans secured by assets such as cars, boats, furniture and jewelry into ABS, according to a term sheet. Are you kidding me? Furniture? Do I get a personal loan and show them a picture of my couch? Do you think when I figure out that I won’t be able to pay back my personal loan that I might take my couch with me? Are they going to hold the items in a massive pawn shop? The 190,627 loans in the Springleaf deal have an average FICO credit score of 602, in line with many subprime auto ABS. But the average coupon of 25% on Springleaf’s personal loans is above that on even “deep subprime” auto loans, probably because there is no collateral for 10% of the issue, an analyst said. The “A” rated slice of the debt may yield near 2.5%, or two percentage points over an interest-rate benchmark, according to price talk circulated to investors. Trouble ahead for the risk trade? The chart below, via BofA Merrill Lynch, shows the size of the rally in credit – and how it has mostly tracked that in other risky assets like the S+P 500 that began in November. However, that uptick circled in the chart above – a significant sell-off in corporate debt at the end of the month – has people talking. Should we see a selloff in the increasingly fragile credit market, it could turn into a rout whose contagion could spread into other risky assets like stocks. I have no idea what the trigger might be, but stock bulls should be aware of this risk. While my eastern friends were digging out from the snowstorm this weekend, we took the dog to the beach today. As well, two weeks ago my daughter pointed out crocuses that had poked their heads above the soil...not that there aren't disadvantages to living on the Wet Coast. Regular readers know that I have been cautious on stocks lately. 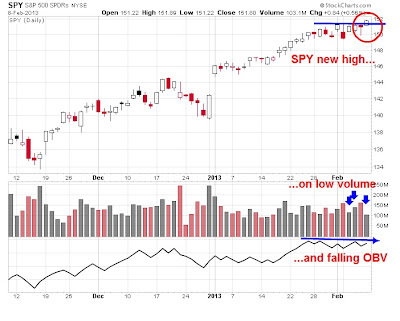 The market action last week is best characterized as volatile and sloppy. 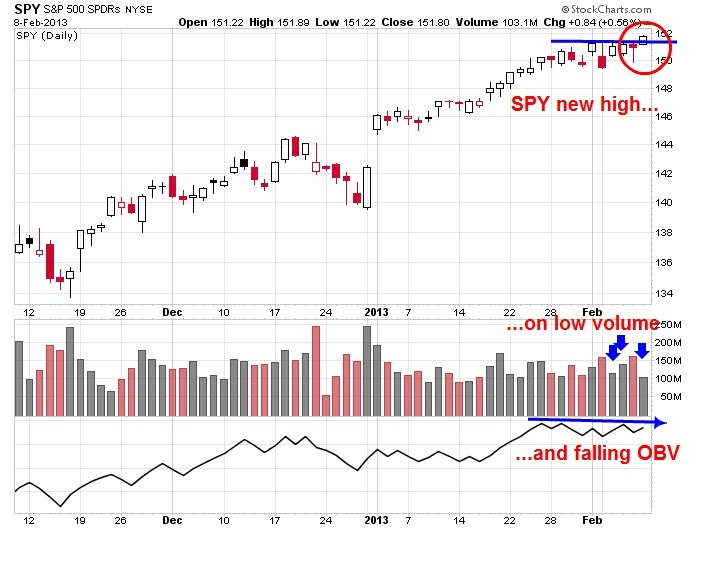 The new high achieved on SPY on Friday was accomplished on low volume and a non-confirmation on OBV, or On Balance Volume. At this point, any call for a correction is at best conjecture. I am watching the relative action of the cyclical stocks to see if a correction has truly begun. The chart below of the relative return of the Morgan Stanley Cyclical Index (CYC) against the market illustrates my point. CYC remains in a relative uptrend and it has pulled back to test the relative uptrend line - but I cannot call it a technical breakdown. Similarly, the relative performance of the Consumer Discretionary stocks against the market as a measure of the risk-on trade shows that this sector remains in a solid relative uptrend. Should the market correct, the relative uptrend line is likely to be broken. Globally, the South Korean economy is known to be highly cyclical and the KOSPI is used as a measure of cyclicality. Currently, KOSPI is showing a pattern similar to the relative return of CYC to SPX - a pullback to test the uptrend line. It could be said, however, that since South Korea is a competitor to Japan in exporting capital goods to China, the recent JPY devaluation is creating headwinds for Korean stocks and the pullback may be reflective of those circumstances. In conclusion, while I remain cautious on stocks and the risk trade, the technical picture shows that the uptrend to be intact and the bulls should still be given the benefit of the doubt for now. Nevertheless, my inner trader is closely watching these cyclical indicators and staying long with very tight stops. Have Mom and Pop REALLY been buying stocks? Recently the blogosphere was full of stories of how the individual investor has been pouring money into equity mutual funds and interpreting this as either bullishly (momentum) or bearishly (retail money = dumb money). But have they really been buying stocks hand over fist? Clients were net buyers of equities in January, but their investments held and adjusted portfolio compositions (net of trading activity) were less volatile relative to the S+P 500 than in previous periods. 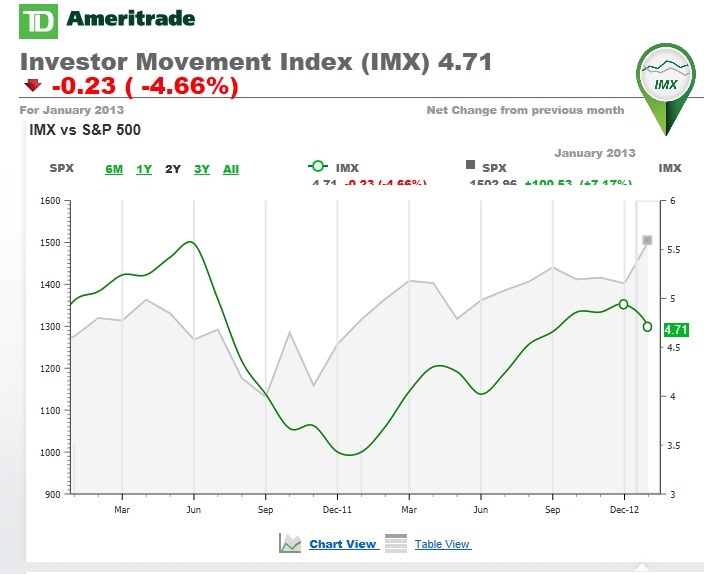 This lowered clients' overall exposure to the equity market and drove the IMX down last month. I have been relatively cautious on stocks lately, largely because of excessive bullishness indicating a crowded long, overbought technical readings (see my recent posts Too far, too fast and More overbought warnings from BoAML) and insider selling (see Insider selling, it's baaack!). I do not base my conclusions on retail investor activity. Nevertheless, I am always looking for either data or commentary that shows the other side of the story. The IMX is one indicator that is definitely worth watching. "In almost perfect coordination with an equity market that was rushing toward new all-time highs, insider sentiment has weakened sharply — falling to its lowest level since late March 2012," wrote David Coleman of the Vickers Weekly Insider report, one of the longest researchers of executive buying and selling on Wall Street. "Insiders are waving the cautionary flag in an increasingly aggressive manner." There have been more than nine insider sales for every one buy over the past week among NYSE stocks, according to Vickers. I have been increasingly cautious, at least tactically, in the past few weeks (see Stocks cruisin' for a bruisin', More overbought warnings from BoAML and Is the whole world bullish?). 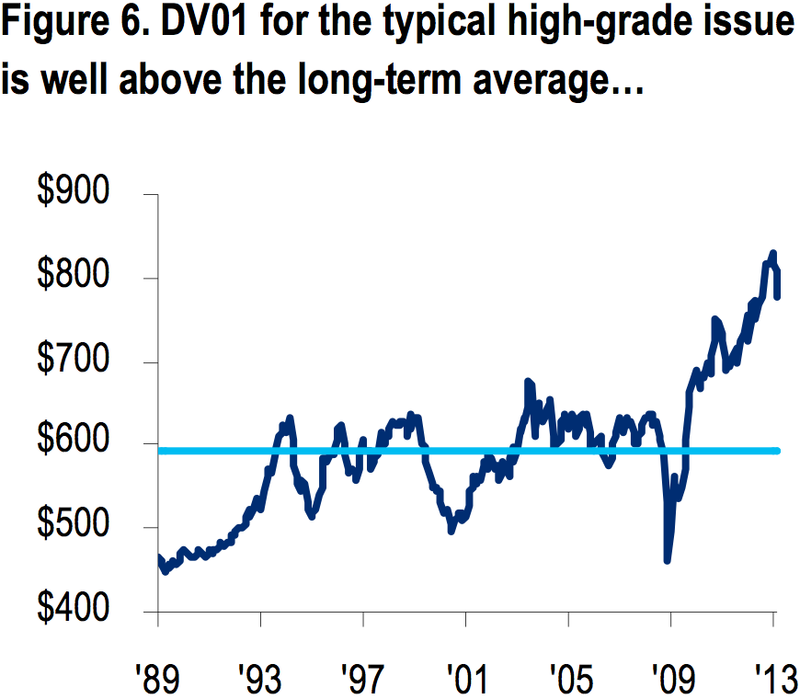 This latest data point from Vickers about insider activity just serves to confirm my near-term bias. 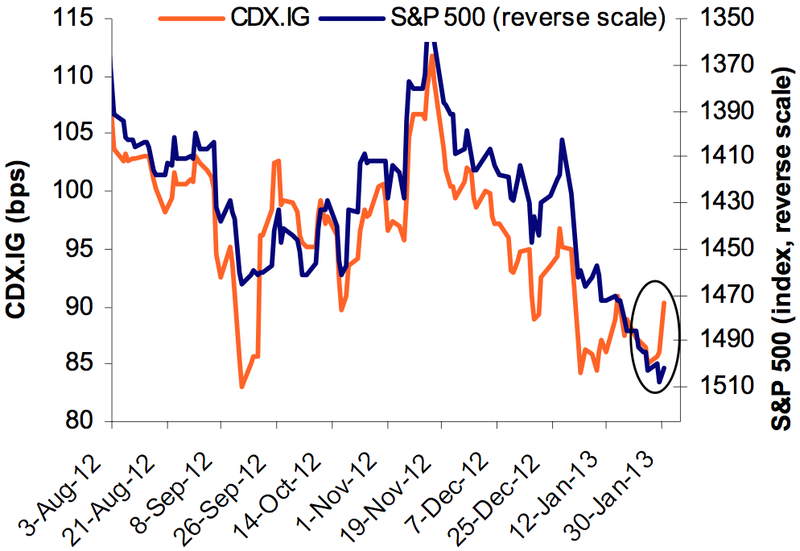 Falling tail-risk = New secular bull? As the Dow passed 14K and the view is turning towards the belief that the financial crisis is over, the logical conclusion is that we are seeing the birth of a new secular bull. Indeed, I examined the kurtosis of stock returns and found that it is falling. 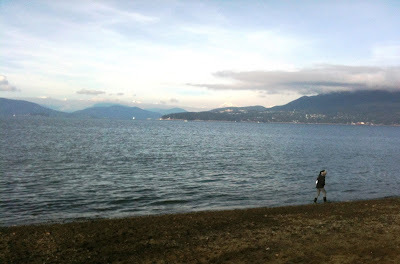 [W]ait till you hear two more terms: leptokurtic and platykurtic. These describe two different distributions, all part of what is known as kurtosis, the measure of the combined weight of the tails of a distribution in relation to the rest of it. When tails become heavier, the kurtosis value increases; when they are lighter, it decreases. A normal distribution has a kurtosis of 0, and is called mesokurtic (A below). If a distribution is peaked (tall and skinny), its kurtosis value is greater than 0 and it is said to be leptokurtic (No ointments needed.) (B below). If, on the other hand, the kurtosis is flat, its value is less than 0, or platykurtic (C below). When kurtosis is 0, it is an indication that a distribution is normally distributed (like diagram A). The higher the kurtosis, the fatter the tails. To give a better real-life interpretation of this measure: A risk-manager at a hedge fund explained to me that once the kurtosis of an investment strategy gets above 2 or 3, he starts to get concerned about unusual fat-tailed events. The chart below shows the trailing one (blue line) and four year (red line) kurtosis of daily SPX returns. We see periods where tails have gotten fatter (Lehman in 2008, Eurogeddon fears in 2011). 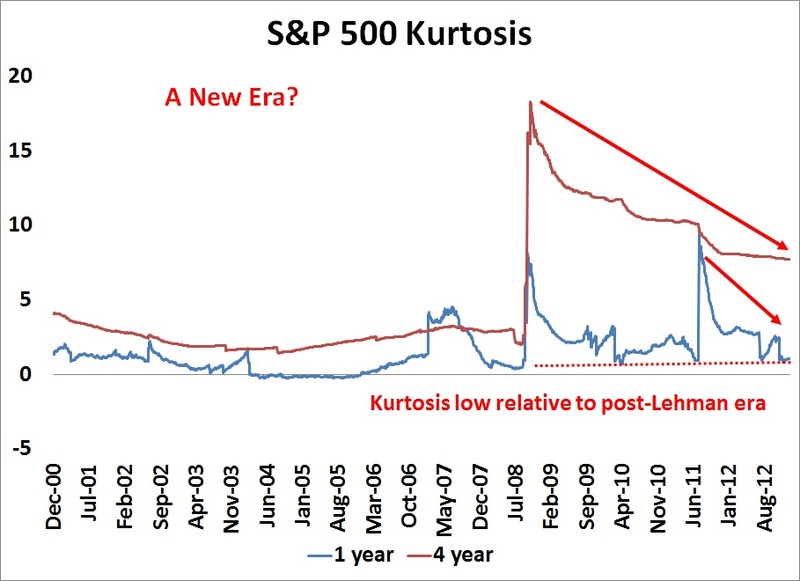 Overall, four-year trailing kurtosis has been falling since the Lehman Crisis of 2008. 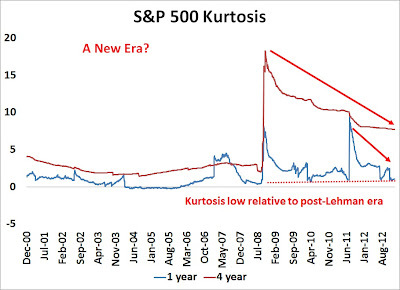 In fact, one-year trailing kurtosis is at the lowest level since the Lehman Crisis. If it were to fall further, it is a signal that the market believes that this is a new era - and perhaps an indication that this is the start of a new secular bull market in equities. Barron's: How is any of this "beautiful?" Dalio: A beautiful deleveraging balances the three options. In other words, there is a certain amount of austerity, there is a certain amount of debt restructuring, and there is a certain amount of printing of money. When done in the right mix, it isn't dramatic. It doesn't produce too much deflation or too much depression. There is slow growth, but it is positive slow growth. At the same time, ratios of debt-to-incomes go down. 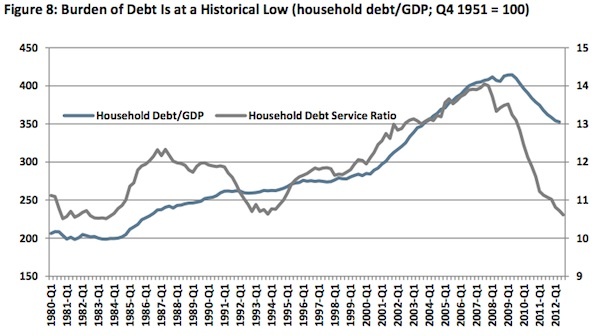 That's a beautiful deleveraging. ...though much of the debt has shifted to the government's balance sheet and the financial services sector is still undergoing a deleveraging process. [D]eleveraging on the private side of the economy has been the flip side of the large government deficits. (In fact, the urge to save and the need to default—rather than stimulus—is the main cause of the sustained slump that is in turn the main cause of the reduced revenues and thus the fiscal deficits.) Figure 6 suggests that, compared with the post-World War II trend of rising household indebtedness, the recent debt reduction is already enough. But there is no financial or economic argument for this trend being the right long- term equilibrium. If wealth and income levels are back to mid-1990 levels, and economic uncertainty at 1970-90 levels, then household indebtedness might be more appropriate at 65% of GDP or even 50% of GDP. Even if the current pace of GDP growth combined with defaults and savings continues, it would take until 2016 or 2019 to reach those levels once more. Here's my problem with the New Era thesis: Dalio runs a hedge fund that is global in scope. While I accept his view that we are seeing the light at the end of the tunnel for the United States, the US isn't the only country in the world and there are other major trading blocs on this earth. I understand Dalio's explanation (via Josh Brown) that there is too much liquidity sloshing around and, with tail risk off the table, cash should come back into equities. However, any rally from such a re-allocation for technical, rather than fundamental reasons, and it is not sustainable longer term, i.e. 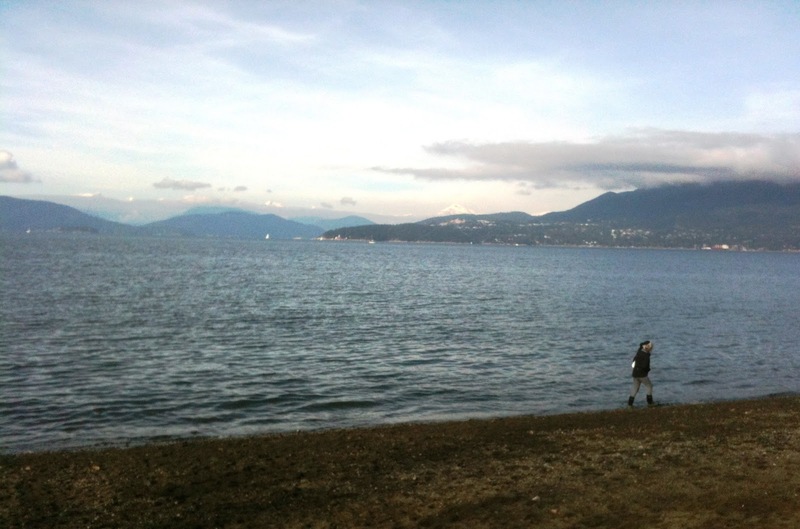 for investors with a five year horizon. Dalio has also said that, in connection with his "beautiful deleveraging" thesis, that Europe has its policies all wrong and certain to see further eurozone crisis down the road. What's more, China is still in the credit expansion phase of its growth and has yet to even begin its deleveraging process, which would be triggered by a realization that it has too much capacity (i.e., too many see-through buildings) supported by too much debt. Simply put, the global deleveraging process is not over! Can we truly have a New Era bull market under those circumstances? Even if the US economy were to start growing at 2-3% real rate, what are the transmission linkages in the global financial system? If Europe were to lurch into another crisis over, say Cyprus, over the summer, can we be assured that a large European bank like Societe Generale won't go down over bad loans and do severe damage to the American financial system? While it is true that the ECB is winning the battle against the tail-risk of a sovereign debt crisis, they have yet to win the peace as there is little prospect of growth on the horizon. In this Project Syndicate article, Eric Labaye of the McKinsey Global Institute asks, in effect, where is the private investment in Europe? Corporate balance sheets are stuffed full of cash, but they don't seem confident enough to invest. If private capital isn't confident enough to invest in Europe, where will growth come from? 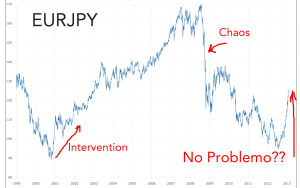 What's more, Bruce Krasting pointed out that the EURJPY exchange rate is skyrocketing. For a export sensitive economy like Germany, this has to hurt and will be a growth headwind for the engine of the eurozone. The other issue I have with the belief that we are witnessing the start of a new secular bull is valuation. Historically, stock market valuations tend to get highly depressed at the start of a new secular bull market. The chart below (via VectorGrader) depicts market cap to GDP, as a simple proxy for the aggregate Price to Sales ratio for the stock market. Note that when this ratio is falling, it coincides with a range-bound stock market. If you were charitable, you could argue that stocks got to fair value before rising and market cap to GDP is at above average valuations compared to its own history. Maybe this is indeed a New Era, but secular bulls generally don't behave this way. The best explanation I have is that the current bull is a cyclical upswing and not a secular one. This analysis suggests that we are still in a range-bound market. Stocks could go higher from these levels, but don't expect them to rocket to sustainable new highs in the next 12-36 months. Another front page sell signal? 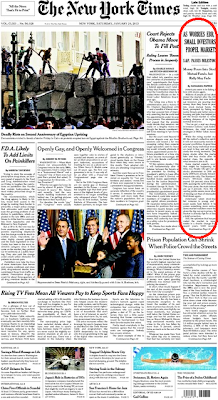 Recently, Barry Ritholz highlighted a New York Times front page article entitled As Worries Ebb, Small Investors Propel Markets as a contrarian Front Page Cover sell-signal.